The journey to the Himalayas with Mohanji was fixed on my mind since year 2012. A group of some of the closest devotees went on to undertake this journey with Mohanji, and came back to their homes completely transformed. I read about their experiences, and I immersed myself in the photos they shared. I could not get a visa back then, so the passion to go to Kailash remained even stronger. When I came to know that this year, the Chinese lifted their rule that 5 people from same nationality can only get a group visa, I was overwhelmed with joy. 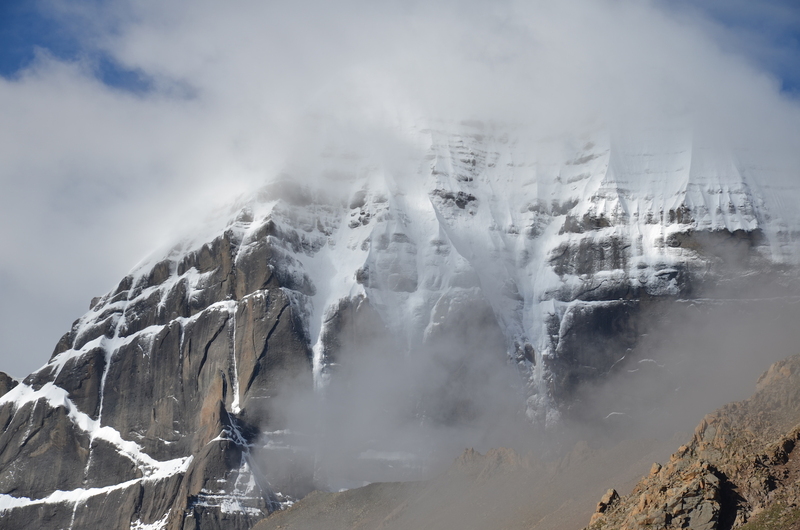 My heart and soul was already transported in Kailash, and I immediately started making plans for the trip. Without the blessing of my wife Anelija this journey would have not happened. She selflessly sacrificed herself so that I can experience Kailash. She didn’t ask for anything, she didn’t put any ultimatums or conditions, she just gave me wings and let me go on this journey. I’m eternally grateful to her. Since we have three little children, she had to take care of them through these 18 days by herself. I wanted to make it easier for her, but how I didn’t know. I talked to Mohanji about this, and prayed silently to him for any help possible. Within a week time a friend of ours came to mind that maybe she can help out since we knew she had babysitting experience. I knew it was Mohanji’s Grace that opened up that possibility of meeting this friend. Some would call this a coincidence, but being a witness to many such Miracles performed so unassumingly by my GuruDev, I knew at that moment His Hand was being involved and divinely intervened. The day came for flying to Kathmandu and starting the Yatra. I had a connecting flight via Istanbul. My connection was 9 hours difference so I stayed at the airport and while waiting I was reading the “Apprenticed to a Himalayan Master” by Sri M. Sitting at a café, 2 hours from departure, a heavy plastic signboard fell on me. As I stood up to go to the departure gate, I barely touched the construction, and since it was already broken it fell on my hand, and chopped a part of my index finger. At first I didn’t notice I was wounded. Then, when I became conscious I saw blood streaming from my finger. I couldn’t stop the bleeding. The people working at the café were looking at me hopelessly and didn’t know what to do. One of them even brought a glass with ice. Blood was pouring out of my finger and I was feeling slightly in panic and helpless. Finally one of the managers of the café called someone and they soon took me to an emergency room where they managed to stop the bleeding and put a bandage. The doctor said I will be in great pain for days so he prescribed me some painkillers. I was chanting Mohanji’s Gayathri all the time, and prayed to Mohanji for help and for everything to be OK. I had to hurry and catch the plane for Kathmandu. I was protected from a bigger accident. I could have hurt my leg or and eye, and my trip would be finished. This was just a wake up accident, and my awareness levels were already elevated with this event. I knew that I’m in for an even more challenging adventure but I still didn’t know what to expect. We assembled at Soaltee Crowne Plaza Hotel in Kathmandu and had a few days to visit Pashupati Nath Temple, and Budhanilkanta Temple. On our way to the Tibetan border we also visited the Kailashnath Mahadev statue near Kathmandu, the highest Shiva statue in the world with 143 feet (44m). 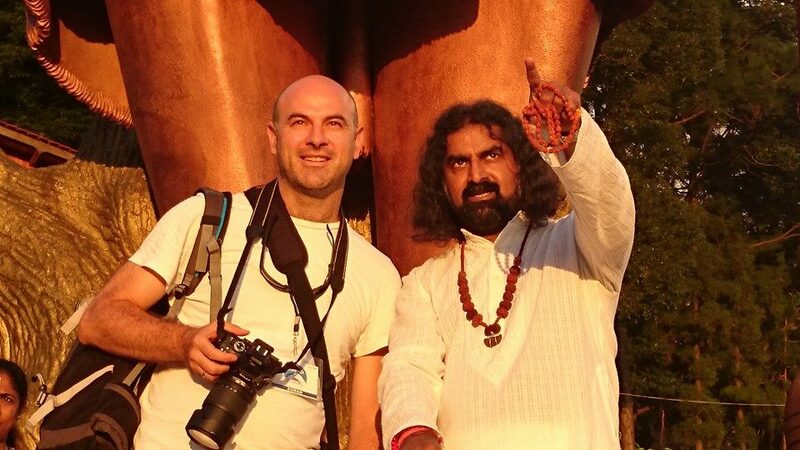 There I had a beautiful communion with Mohanji. The sun was setting down, and the whole scenery was majestic, overlooking the Kathmandu valley. There was a huge landslide wiping off the only road leading to the Tibetan border. Helicopters were promptly organized and in groups of 5 people we were being transported over the landslide and to the border. The waiting at the helipad seamed like forever. I came first at the flight off ground with Mohanji , Biba, Sumit, and Swami Govinda, and I hoped I will enter the first helicopter with Mohanji. But, though I was in the first five, Phaneendar took the fifth seat. I was quite disappointed, and I thought I will never fly over. Mohanji said that at any moment the helicopters can be called off on a rescue mission since the landslide wiped out a lot of houses on the hills as well, and there were any casualties. I had to learn patience that day, and fly with one of the last groups of people. We came already late and the border was closed so we had to sleep over near the border along a beautiful river that was dividing Nepal and Tibet. That night I developed a high fever. I already started feeling the higher altitude symptoms. A lot of people were stranded in Nepal and were not being able to go forward to Tibet. Our group was flowing through the challenges as if protected and helped by some higher force. The view that cleanses lifetimes of karmas. 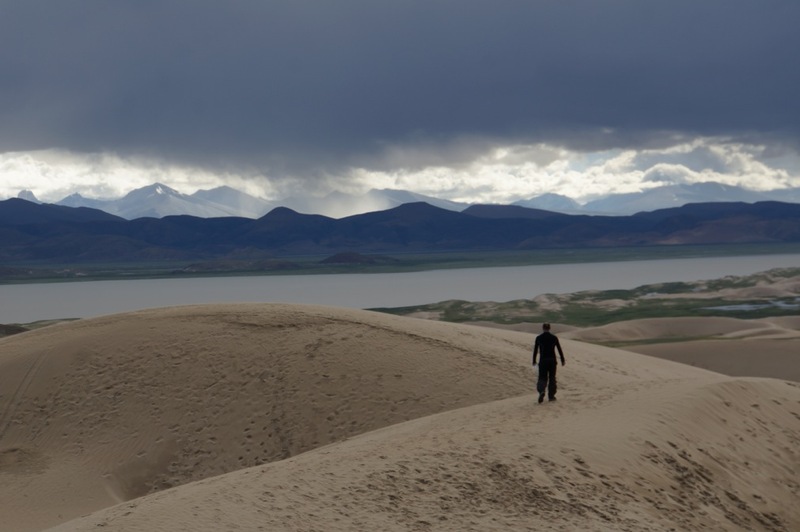 Traveling via Nyalam (12,300ft), and Saga (15,200ft) towards Lake Manasarovar (15,100ft). The hypoxia symptoms were hitting hard. I was having bad headaches, and nausea. The chilly and spicy food made it even worse. I eased it all with a bread and butter diet, and masala and ginger tea. We accommodated at a guesthouse near the lake with an amazing view and an old temple nearby. On the second day we had a beautiful fire ceremony, and after that another round of dips in the lake. The night before the Parikrama, as I was relaxing on my bed, a voice in my head was calling me to go to the temple on the hilltop. I was being pulled out of my bed and off I went to the temple. The weather became windy and there was nobody around the temple. Nothing, I thought I was just imagining the voice. 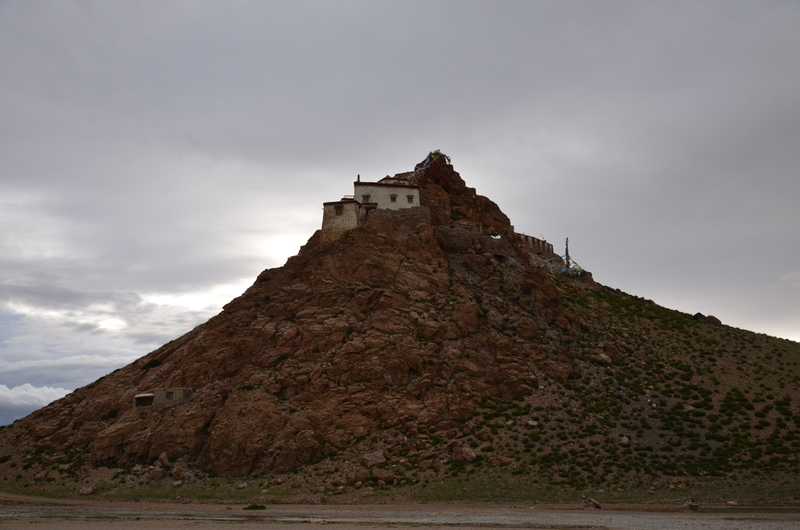 And as I decided to go back to the guesthouses, a Tibetan family appeared out of nowhere. I started following them around the temple, feeling pulled by something. Then, an old man who I guess was the guardian of the temple showed up and they started talking something in Tibetan. Then he opened a door leading to one cave. It was a man made cave where a lot of saints were meditating I came to know. They started touching the stones with carvings on them, and prostrating at the photos of the saints. I was following and repeating all the rituals they did. As I was prostrating I was feeling all the saints blessing me to have a smooth Parikrama. That’s why I came, I thought. I came to be blessed. Then, we entered one bigger cave with lots of photos, lamps, and Tibetan symbols inside. I prostrated again, thanked the saints for blessing me and made the exit. It was getting dark so I rushed back to the guesthouses while a group of 5-7 dogs were barking and making a wild pack so I rushed even more. 🙂 I came back safely to my room and quickly went to bed. 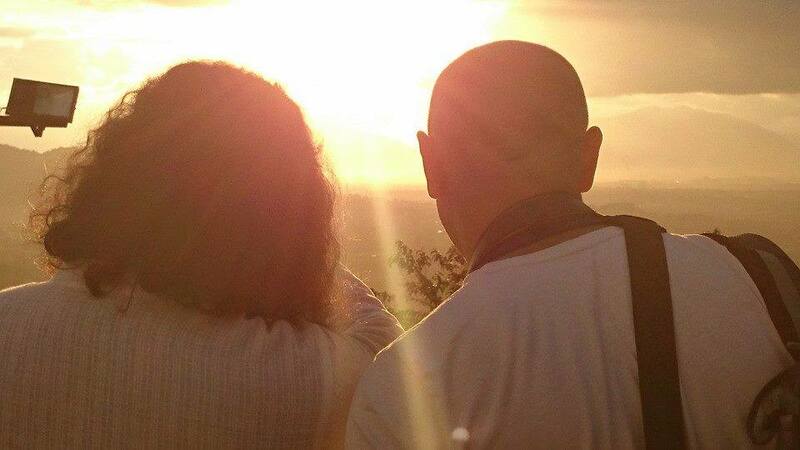 That night I slept like a baby, and woke up in the morning fresh anew and ready for the Parikrama. There is nothing one can do to prepare for this kind of pilgrimage. The body’s reaction to low oxygen is unpredictable. 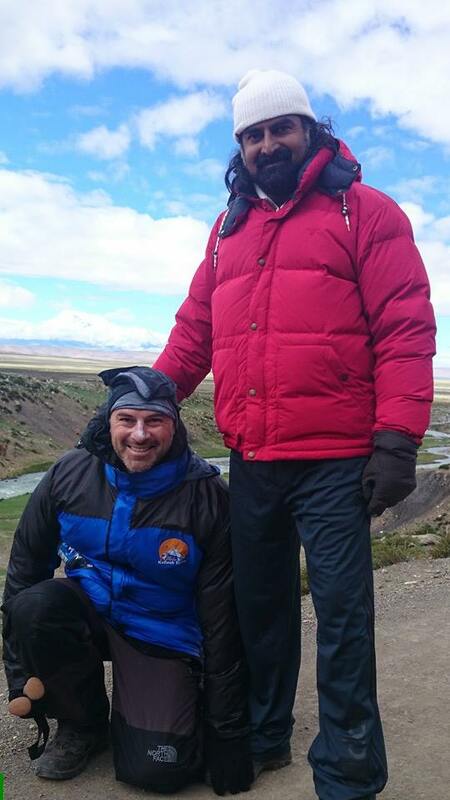 One could be very well fit at sea level altitude but at 5700m one’s fitness is irrelevant. The relevance falls to Grace and surrender only. I had a knee and ankle pain for months. I was sure I’ll have difficulty with the long distance walking. But, as that day started all of the pain was gone. The first five kilometers walking were bearable and enjoyable with the streams and mountains. The second half of the journey was horrific. I could only make few steps and then was grasping for oxygen. My body was screaming for rest. It was overwhelming. Luckily, I took a good advice to hire a porter for my backpack. I was against paying someone to carry my bag since it my mind it was as if I’m cheating the experience of Kailash. But, I was advised and realized it was all an ego trip story. My porter was a warrior. It was his 20+ Parikrama trip so far, and the whole thing was a child’s play for him. In many ways it was intimidating, and he was pushing me and pulling me all along. I had to stop and pause many times to catch hold of my own pace. It was a key moment for me – catching my own pace. All along I was either rushing to catch up with Mohanji, or the porter was pulling me to keep up with his pace. When I arrived at the guesthouse at Hirapuch camp, overlooking North face of Kailash, all I wanted was to crash on my bed. And that’s what I did. One thing I was certain of – if I was to make it the next day it would be only with Mohanji’s Grace, nothing else. My body was already depleted, and there was no way it would be prepared and fit for walking another 22 km on a steep climb with such thin air. Next morning, I woke up fresh and strangely my body felt well prepared. I saw Mohanji near by, so I went to touch his feet and ask for a blessing and smooth journey. He said “Don’t you worry, everything is arranged.” 🙂 These words were enough for me to be sure I will make it walking through the whole 22 km. He cleared all doubts for me. I was led by two thoughts, one of which was to walk slowly, and the other to follow my own pace no matter what. Walking with Mohanji in the Himalayas. It was my dream come true. Third day felt like walk in the park. Six kilometers of almost all the way straight walking beside Mohanji. It was my dream come true. Mohanji arranged everything so that most of us make it smoothly through the parikrama. It was all his orchestration. He summoned us in the Himalayas so that he can cleanse us from our karmic baggage and bring us home safe and more light. He took a lot of heavy baggage on himself and burned it. One of the visible physical baggage’s he took over was a knee pain. He had to take a pony for the Parikrama cos he took over the knee pain of someone who prayed to him for help with their severe knee problem. It’s been a month ago since we got back from the Kailash trip as I write this. I’ve changed at so many levels. I have left a lot of baggage in the Himalayas. For good, and for ever. How do I know it’s forever? Since, through the years, all the miraculous transformations I’ve been through where Mohanji was the catalyst are permanent. The peaceful power of the snowy Himalayan mountaintops is still here inside my inner space. My boundaries were being pushed, expanded and on so many levels even wiped off. Thanks Zohan.I have completed my pilgrimage to Kedarnath last month.My next destination is Kailash. Thank you dearest Zoran! I enjoyed reading, I felt as I was there. Wonderful! Thank you! !